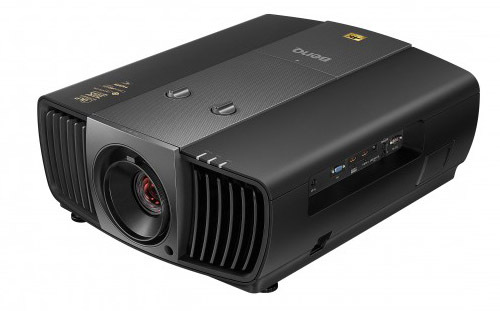 The BenQ HT8050 CinematicColor(TM) home theater projector is the company's first 4K projector for home theater, featuring Texas Instruments' 4K UHD DLP chip with the ability to put 3840x2160 pixels on the screen. The HT8050 is a substantial high-end projector, weighing 32 lbs. It features beautifully crafted black casework and exudes a sense of quality workmanship from the moment it is lifted from the box. BenQ makes a range of home theater projectors including the highly popular BenQ HT2050, but this one is clearly in a league by itself. The HT8050's primary advantage is an exquisitely sharp display of native 4K source material thanks to a combination of the 4K chip and an exceptionally high performance lens. In a comparative side by side viewing with the Optoma UHD65 (a much less expensive model using the same 4K chip), when there is extreme detail in the 4K source the HT8050 is able to render it with incremental precision and clarity over the UHD65. Color fidelity is a highlight on the HT8050. Its RGBRGB color wheel and superb color processing provides the ability to dial in precise Rec 709 color accuracy. In point of fact, the HT8050 is one of the few home theater projectors to carry THX certification. And the high speed 6x color wheel ensures that rainbow artifacts are virtually nonexistent. Eco mode. The HT8050's Economical mode reduces lumen output in all operating modes by 33%. Zoom Lens Light Loss. The lumen output of the HT8050 is curtailed by only 10% at the telephoto end of the zoom lens, which is far less than is typical for a 1.5x zoom. Brightness uniformity. Uniformity at the wide angle end of the 1.5x zoom lens is a very solid 87%, and at the telephoto end is still a good 82%. Input lag. With a 1080p input signal the measured lag is 65 ms. We do not have a measurement for lag on a 4K signal. Fan noise. Fan noise is audible in a silent room, but it is low and unobtrusive even when the lamp is on full power. Fan noise drops to nearly silent in eco mode. Simply put, nobody will be bothered by fan noise on this projector. In High Altitude mode, the fan noise is elevated somewhat beyond the standard full power mode, but it is still quieter than most home theater projectors in their respective HA modes. Almost everything the BenQ HT8050 does, it does well. 4K image detail resolution is as good as it gets, color fidelity is excellent, fan noise is low, H+V lens shift range is outstanding (the most range we've ever seen on a DLP projector) and there are zero rainbow artifacts. In terms of picture quality the only notable issue is in black levels and contrast. On this particular performance characteristic (especially black levels) it is somewhat deficient in side by side evaluations against most home theater projectors in its price range and some that are below it. So this 4K projector essentially offers a trade-off that may appeal to some buyers and not others. Some 4K source images that have exceptional detail are incrementally sharper on the HT8050 than on the Optoma UHD65, and the HT8050 is capable of producing more accurate color, especially in THX mode. But the UHD65 has an edge in contrast and, most notably, black levels. The UHD65 also has frame interpolation, a video processing feature that can in many instances (with live performance video in particular) add image stability and clarity. The HT8050 does not have frame interpolation. In addition, there are several other features missing on the HT8050 that are standard on most home theater projectors in its price class. It does not have HDR, which most 4K enabled projectors have at this point. We are not fans of HDR so we don't miss this particular feature, but a lot of consumers are interested in it. There is no 3D due to the fact that there is no 4K 3D industry standard established yet. But the lack of 3D for 1080p sources will be missed by users who have 3D Blu-rays in their collection. There is no keystone adjustment. For a projector of the HT8050's size, weight and price, it is unusual to see manual zoom and lens shift. All competing models from Epson and JVC have powered lenses that support automated Lens Memory for constant image height installations on Cinemascope screens. Some people love this feature and others don't care about it at all. Of course, the Epson and JVC projectors are pixel-shifting machines that do not have the same resolving power of native 4K sources as the HT8050, but they are higher in contrast and have deeper blacks which helps enhance the subjective impression of detail. So again, it is a question of trade-offs. In recent years BenQ has produced an impressive array of highly successful home theater projectors that have been recognized for their exception value propositions, including most notably the best-selling HT2050 and the lightning quick gaming model the HT2150ST with its 16 ms input lag, which won our Editor's Choice Award. Of course these are much lower priced models that are targeted for the mass consumer audience rather than the high-end home theater aficionado. When it comes to the HT8050 priced at an MSRP of $7,999, we do not see the same compelling value proposition that is apparent in many of BenQ's other products. At the end of the day, it all depends on what is most important to you. The BenQ HT8050 is a 4K home theater projector that has excellent resolving power and THX certified color, but is limited in features. For those whose overriding primary objective with a 4K projector is to get the absolute maximum image detail possible onto the screen, the HT8050 would be a good choice, as (so far) we have not seen any other projector in its price class that does this better.